ThinOPTICS reading glasses are so compact and convenient, keeping them on hand is a no-brainer. Even better than foldable reading glasses, this pair has been pared down to just lenses and a metal bridge. They’re super thin and light—weighing less than a nickel. Don’t let the small scale fool you, though. These glasses are tough. The lenses are made with the same shatterproof material used in bullet-proof glass, and the bridge is made from Nitinol—a metal ten times more elastic than spring steel. For reading, the design sits low on your nose and stays put, thanks to Flexgrip technology. Check text messages, peruse a menu, or read prescription labels. When you’re done, slide these readers into their super slim carrying case. It attaches to the back of your phone or fits in a wallet, jacket pocket, glove box, or anywhere else. Now you’ll always be able to see when you need to. Hello Grommet Fans! 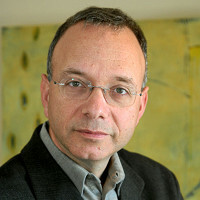 I am David Chute, a co-founder of ThinOPTICS. Teddy Shalon, the inventor, my partners, and I invented and are commercializing stick anywhere, go everywhere reading glasses that are always with you. 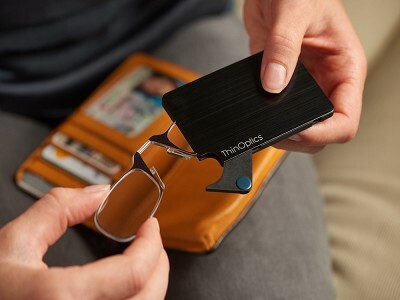 ThinOPTICS readers are as thin as a credit card, weigh less than a nickel, fit securely and comfortably on every nose, and can fit on the back of a smartphone, or slip into a wallet, pocket, or purse. I know five people right off the bat I could get these for. How did you get the idea and then actually turn it into a business? My partner, Teddy, is a serial inventor of medical devices who has about 25 patents, all in pharmaceuticals and med tech. He was on a bike ride with an over 50 year old friend who received a text that he couldn’t read because he didn’t have his reading glasses with him. Teddy, who wears regular glasses, read the text for his friend and thought it would be a great idea if you could put something that is never with you when you need it (reading glasses) on something that's always with you (smartphones). I'm a serial entrepreneur in eyewear (I’ve started many successful eyewear and sunglass companies) and we were introduced by a mutual friend about 6 years ago. I felt that the concept was good, but that the reading glasses would need to be attractive, affordable, one size fits all, stable on the nose, durable and have great optics. It took us over 2 years and 200+ prototypes to achieve this goal. Reading glasses in particular haven’t really been revolutionized. Were there any challenges you faced in trying to redefine a product that has been the same for so long? The biggest challenge was redesigning reading glasses so that (a) one size would fit everyone and (b) the readers wouldn’t fall off. That required us to understand the wide range of noses (thick/thin; flat/steep) so that one bridge would fit all noses. We accomplished this by using the most flexible metal in the world (nitinol super elastic alloy) in the bridge and independent suspension nose pads that will conform to different angles on the nose. We also had to develop a ‘sure grip’ nose pad surface that would not fall forward/slide off, even if the wearer’s nose is moist from perspiration, or covered in makeup. We literally tried different prototypes on hundreds/thousands of noses before we got the exact (patented) fit and materials made properly. We also needed to design a case that would hold the readers when you weren’t using them, and would allow them to be easily pulled out when you needed them. The case was designed to fit on the back of any plastic or metal surface so it could attach to a smartphone, iPad, and notebook computer. We also made it as thick as three credit cards so it could slip into a pocket, wallet, purse, billfold, or anything that you tend to take with you all the time. We have 100,000+ users and we survey them all the time. They absolutely love the product to the point where it has become addictive. 30 million Americans buy 50M readers every year, and they frequently own 6 to 8 pair which are scattered all over the house and office. They are everywhere, except with you when you need them. By putting readers on the back of a smart phone or in a purse or wallet, these people always have their reading glasses with them. More than half of our users use ThinOptics MORE THAN their regular reading glasses during the day; and they tend to tell at least 5 friends per month about the product. It has become extremely viral. Our users buy several pairs a year, usually putting one on the phone, and another in things that they carry with them all the time (purse, computer bag) or attaching them to things that require readers (compute monitor, notebook computer; golf bag (for score card); gym bag (to unlock gym locker)). How sturdy is the case? Hi Lisa, it is very sturdy. It does not bend and has the feel of a phone case but for tiny glasses. How is it designed to attach to a phone case? Hi Will, there is an adhesive on the back of the case that will stick to phones, tablets, or laptops. The double stick tape will attach to any flat surface like plastic or metal. If you want to eventually remove the case, you can pry it off. Any residual adhesive can be easily removed by rolling it off with your thumb. I have read recent comments on ThinOPTICS that the glasses have a tendency to fall out of the case, and that the case will actually scratch the lenses. Hi Lisa, we have not found that to be the case. The opening of the case is narrower than inside. So you have to flex the glasses to get them in and they fan out slightly with the extra space inside. This creates a type of seal. I was just waving it around like a mad man and didn't have them fall out. I also did not see any scratches on the glasses. Not to say that these glasses will never fall out of the case or scratch, but with normal use you should not have any issues. We have a lifetime guarantee on our ThinOptics readers, so if your lenses get scratched, we will replace them. We designed the edge of the reader to be higher than the highest surface on the lens, so that when it slides in and out of the case (or on a flat surface) it won't scratch the lens. Of course, if it is abraded with sand or a hard surface, ThinOptics can scratch like any prescription lens. The material in ThinOptics is optical grade polycarbonate, which is the same material used in prescription eyewear. Love these was ready to order for me and my mom but you don't have our strengths. Any plans to make 1.00 or 2.75 ? Hi Dawn, I'll let David chime in on the 1.00, but the 2.75 will be covered by the +2.50 option you see at checkout. We carry three powers: +1.50; +2.00; +2.50. The way reading glass powers work is that they help your eyes focus closer than they would otherwise. By moving the object you are reading in or out an inch or two, that is the same as using a stronger or weaker power. For example, the difference between a +2.75 and +2.50 lens is 1.4inches. In otherwords, if the +2.75 allows you to focus on objects that are 14.3 inches away, the +2.50 will allow you to focus on the same object 15.7 inches away. Can you make them with one lens only? I have mono vision and only need up close correction in my right eye. Will the glasses "fit" or stay on if there is only one lens? @Melanie I'd be really interested in the answer to this also. Or could one lens be made clear???? Hi Melanie, and Elizabeth, I don't know how possible it is to make a monocle version given the design, but David will know better than I. In order to keep the cost extremely low to make ThinOptics accessible to the largest number of users, we injection mold the left and right lenses at the same time with optical grade material. All traditional reading glasses sold in pharmacies or mass merchants use the same power in the left and right eyes because most people's near vision deteriorates at the same rate. (This means they usually need the same power in each eye.) Custom made reading glasses can be purchased through an eyecare professional, but that will tend to cost quite a bit more - closer to $75 or $100. I love them, I have been using them for 6 + months and find them very convenient. I had a pair that the nose "pad" broke off and it was replaced with a new pair of Thinoptics in a matter of days without fuss. Thanks Paul! I appreciate the vote of support. We try hard to keep all of our loyal users happy with ThinOptics. You said a lot about how durable they are in your YouTube presentation but the one thing I don't think I heard about being scratch resistant glass. Is it scratch resistant? Hi Pamela, yes, they are made with the same shatter-proof material that bullet proof glass is. If you can scratch these, that would be impressive. There is also a lifetime guarantee so you will get a replacement pair for free. @Mike: Awesome, that was my concern, too... Just ordered four pairs to scatter around the house, one for my wallet. Glad to hear it, Philip, enjoy! Thanks Philip - Many of our users have multiple pairs of ThinOptics. 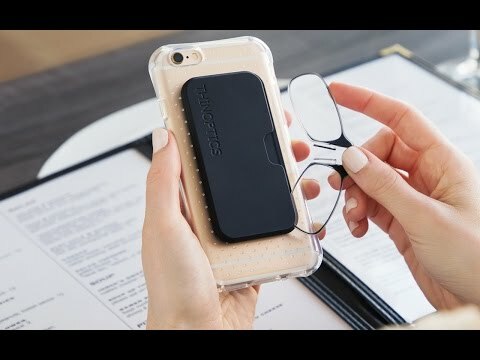 Some put ThinOptics on their phone, or in their purse or wallet, or in a golf bag, or attach it to the side of their lap top so it's always with you when you need it. I need 3.25 strength. Are you going to make them? Hi Veronique, it's certainly possible. I'll have David speak to future plans for ThinOPTICS, but expanding the offerings is probably at the top of the list. Thank you for your suggestion. We will research to see the number of requests for higher powers and make the decision. In the meantime, the +2.50 power should allow you to focus at about 15.7" whereas the +3.25 power would allow you to focus a little closer - at about 12". I believe you will find that the +2.5" will still help quite a bit. Sorry that we don't have the +3.00 or +3.25 available right now. David, as I have gotten older (48) my ability to read small writing is terrible. How does one go about finding their required strength - eye doctor? Short of this answer I am ready to order. Thanks! Hi Chuck, yes, that would be the place to go! I am going to order a pair for general use. However, if you also made the same design but included filtering for glare from computer monitors it would be really great. I have purchased such full size "glare" glasses from Best Buy, or maybe it was Staples, but if I could get them in this form factor I would buy right away! Hi Errol, I wouldn't rule it out of ThinOPTICS' future plans. If they make any updates to their offerings on here, we will be sure to let you know! Thanks for the great suggestion. We are building a list of future new product ideas and we will add this one to it. It turns out that a huge number of people get digital eyestrain from staring at their computer screens all day. There are blue light blocking filters that can help ease eye strain a little bit for some people. Since a lot of our users attach ThinOptics to their notebook computer, or the side of their desktop monitor, this is something we will look into. Appreciate your suggestion. These glasses sound wonderful, but I would need a stronger strength. Are you eventually going to make up to 375, as I would love a pair for myself and husband. Thank you. It's very possible, Jean, I'll let David chime in with specifics on future plans. Based on your and Veronique's suggestion (a little higher up), we may have to add a stronger power. In the meantime, for you to test how much +2.50 can help, if a traditional reader with +2.50 lenses can help you read a little better, then the +2.5o ThinOptics will provide the same degree of assistance. Thanks for your and your husband's interest in ThinOptics. Hi D.L., you are right. You should only use them in the car if you are stopped or not driving at all. We definitely DO NOT recommend reading a text while driving. However, a real problem for those of us who use reading glasses is that it's almost impossible to read the street names on Google maps if you don't have your readers with you. By having a pair of ThinOptics on your smart phone, you will always be able to read your google or apple map. Of course, you should be safely parked before reading your smart phone map. ThinOptics can help you see, and navigate! I've had my ThinOPTICS for about 10 days now and I LOVE THEM! I keep my on my Smartphone. They work perfectly. I have a bad habit of leaving my readers in the car or at home. I am always looking for glasses when it comes time to read a menu in a low lighting situation. I have my phone with me at all times, and now I have my glasses with me as they are on the phone. I get many questions when I pull them out. They are made very sturdy, the magnification e.g. 1.5 is true, and they just fit perfectly in the little case. I was worried they would come off very easily or slide off. They stay on without any issues at all. Thanks for a great product! I tell everyone to order. They will not regret it! Wow, that is so great to hear, Vicki, thanks so much for the kind words. We appreciate the real-world feedback. @Mike Uh...the word you meant to use is "hear". Not "here". Thanks for keeping me in check, Sandra. Thanks Vicki We spent over two years and made over 200 prototypes before we settled on the current design. We wanted to get the product absolutely right before we launched it. Hearing your feedback let's us know this was time well spent! From the video it looks as thought the glasses need to lay expanded in the case, can the be folded in half and be in a case without damaging them?? Hi Kenneth, the glasses are: 4.5" x 1" and the case is: 3.75" x 1". You just need to bend them slightly to fit in the case, they will not fit folded in half. @Mike What is the case - plastic? The case is made with injection molded polycarbonate. This material is used in CDs, shatterproof safety glasses and ballistic military goggles. It will stop a bullet (although we don't recommend trying that at home.) It is completely shatterproof, so it will protect your readers. Just ordered my pair! I have been looking for reading glasses that I can lay in bed and read comfortably these look like just what I have been wishing for. David is making your wish come true, Sue! Sue - we are not only the inventors, but we are users too. I read in bed and use my ThinOptics all the time. They are on my phone, and always with me. I used to have walk around the house hunting for my regular readers. Now my ThinOptics are always with me. I now spend less time hunting for my readers, and more time reading. @David You spoke earlier about removing the adhesive, if needed. I know in the next 6 months or so that I will switch to a different phone (and case). Do you sell additional adhesive or what would you recommend I use as a replacement to attach to my new phone? Hi Suzi, it uses 3M double-sided tape so you can just stick that on whenever you are ready to change phones or cases or contact ThinOPTICS here. You are out of stock on both colors in the 1.50. How long before they are in Stock? Should be within the next week or so! I want these but I need 1.25. You don't have that strength? Thanks for you interest in ThinOptics. The +1.50 reader works well for the range between +1.25 to +1.75. Reading glasses are measured in "powers" with the higher number helping you focus closer than you might otherwise. The difference between the power in a +1.25 and +1.50 is very slight and most people might not even notice it. If you visit your local pharmacy and look through the +1.25 and +1.50 readers, you will notice very little difference at that power range. Thanks! I have had a pair for a while now, and although I find them extremely helpful and convenient, I also find them very unattractive. I find myself hesitant to use them in public and when I must, I do so as quickly as possible, so as not to be seen by others. Call me vein, but I just don't like being seen wearing them! I would buy more and use them more often if they were pretty and fun like some of my fashionable regular readers are! We have fashion colors which we can make available if our friends at Grommet would like us to do so. Some of our users sneak ThinOptics on and then slip them away in their small case. Others love wearing them because they believe ThinOptics makes them look cool and hip. I guess beauty (and hipness) is in the eye of the beholder.